The first American constitution was ratified by the colony of New Haven on this day in 1639. The entire community assembled in a newly erected barn where the eminent Puritan pastor John Davenport (1597-1670) preached and prayed earnestly—and then proposed fundamental articles for the governance of the colony. His four articles were simple: First, they were to affirm that the Holy Scriptures of the Old and New Testaments contain the perfect rule for government by men in commonwealth, church and family. Second, they were to affirm that they were therefore to be guided by the Scriptures in all matters. Third, they would covenant to establish a local church and erect a house of worship in which the congregation would meet. Fourth, only then would they establish a civil order to implement the articles and ensure prosperity for themselves and their descendants. And fifth, this new civil jurisdiction was to be ordered federally and covenantally by the consent of the governed. The society they created was thus carefully organized along Biblical lines. Twelve members were chosen to rule the "colony" and seven of them would also serve as "the seven pillars of the church." In addition, they elected a chief magistrate and took steps to incentivize the economic productivity of the colony. This was the first truly autonomous government by colonists in the New World. The inhabitants of New Haven swore allegiance only to their own civil government and not to king or parliament. 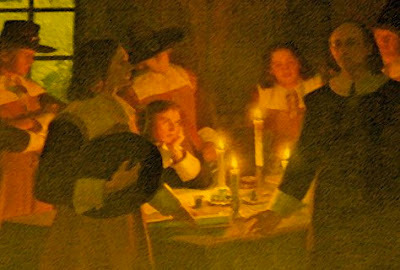 After 23 peaceful years, they were compelled, in 1662, to unite with Connecticut. Davenport, who was the founder of the colony and it's college, Yale, fought this merger fiercely, fearing that the community's uniquely Christian distinctives might well be lost amidst the effects of conglomeration. Alas, his fears were ultimately realized. Nevertheless, despite its short-lived tenure, the Fundamental Articles of New Haven set a pattern of Christian federalism and covenantalism that would be the hallmark of American constitutionalism for generations to come.